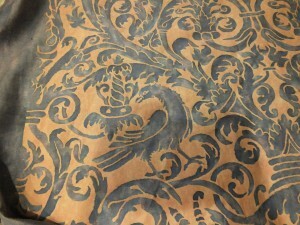 Fortuny, my favorite fabric, is just as special on the back side. Lucky for me, I was able to honeymoon in Italy. While in Venice, I visited the Fortuny store where you can see numerous bolts of fabric and purchase directly. I selected a beautiful green and gold pattern to take home to my mother as a thank you for my wedding. She loved it, of course, but preferred the back side to the front. I told her that she absolutely could not use the reverse. This was Fortuny after all. The gold was too gorgeous to cover. Well, that was 21 years ago. I have long since seen the error of my ways. I have a chair that I upholstered using the reverse side of the pattern, Campanelle, because I loved the subtle grey blue with soft chartreuse green. The pattern was a small one, so the correct side was a bit too gold and too busy for this particular use. Carefully consider how you will use your Fortuny before you cut. Currently I have two large pieces of Fortuny that I have been holding onto for some time. One is this lovely blue and peach pattern with birds. I always wanted a pair of chairs such as Mary Emmerling’s pair in her Santa Fe house. Never did find just the right pair of chairs so it has waited patiently folded up in my closet. 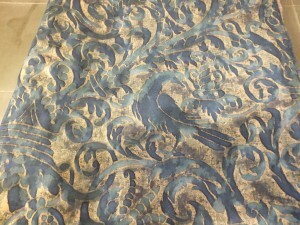 Recently, I have been thinking of making a platform bed out of this fabric. After much deliberation I drew up my sketch and PO for my upholsterer to begin. But then, I sent him a frantic text telling him not to cut it. 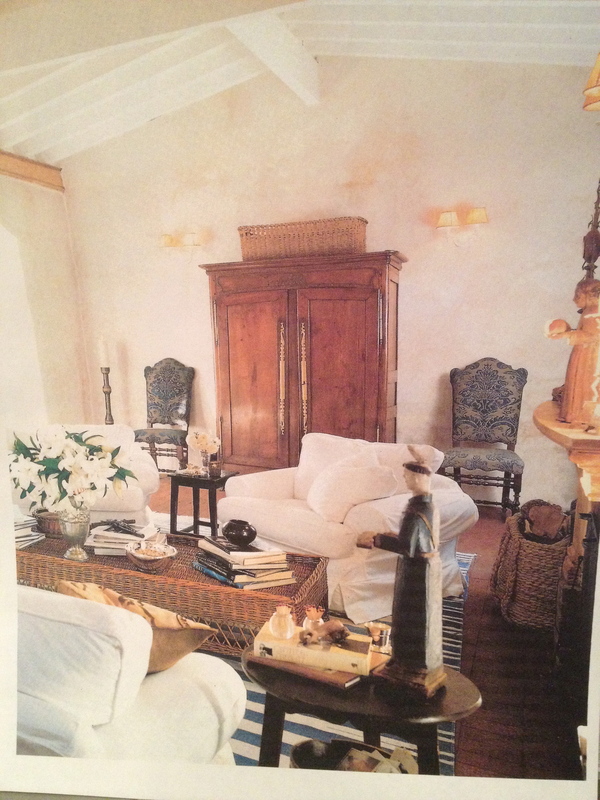 It was such a large piece of Fortuny that I couldn’t imagine cutting it up for such a small project. Now I think I will save it to make a screen to cover up our wall hung TV. BUT, I think I prefer the back side again. Even though you can barely make out the birds when looking at the reverse, the many shades of blue are so gorgeous when looking at the back. It almost looks like Italian marbelized paper. My other Fortuny treasure is 4 yards of this pattern. This fabric is way too strong for me except for possibly a pillow in the facing fabric. So much gold, not my style. The reverse though is beautiful. The loveliest shade of brown and cream. This will be my new platform bed. I can’t wait to see it. This reversing of fabric is, of course, not a new idea. House Beautiful featured an article in this month’s magazine. For help deciding which side of the fabric to use in your home, contact Casa V Interiors.